Should Hong Kong Accept Fake Democracy? A version of this article was first published in Foreign Policy in Focus on August 7, 2014. It also appeared in Eurasia Review and in the Wall Street Journal’s Web Headline links. Hong Kong is now the most politically polarized it’s been since its return to China in 1997. That discord was on full display last month when hundreds of thousands took to the streets in a mostly peaceful protest at the annual July 1 handover anniversary march. The ubiquitous banners, placards, and booths along the three-mile route showcased Hong Kongers’ perennial complaints—including a widening income gap, unaffordable housing, and creeping mainland Chinese influence. Yet one theme, as if embodying all of the city’s ills, seemed to unify the marchers: the long-held demand for genuine universal suffrage in Hong Kong’s next chief executive election in 2017. Currently, Hong Kong’s top official is chosen by a pro-Beijing “election committee.” But most residents have grown tired of their undemocratic system and are now stepping up demands to be able to elect their leader directly. If denied, Hong Kong could face another decade of political paralysis, poor governance, and sharpened tensions with the mainland. The majority of Hong Kongers have long expressed the desire for genuine universal suffrage—the right to both vote and stand for election—as called for in the International Covenant on Civil and Political Rights. China has acknowledged these aspirations, but has sought to water them down over the years. The 1984 Sino-British Joint Declaration on the return of Hong Kong to Chinese sovereignty established that “The chief executive will be appointed by the Central People’s Government on the basis of the results of elections or consultations to be held locally.” Hong Kong’s Basic Law, its “mini-constitution,” states that “The ultimate aim is the selection of the Chief Executive by universal suffrage,” but specifies that it be “upon nomination by a broadly representative nominating committee in accordance with democratic procedures.” In 2007, the Standing Committee of the National Peoples Congress reaffirmed the Basic Law and provided a timetable of 2017 for the first such election. This contradiction between requiring a “nominating committee” and allowing “democratic procedures” is at the heart of Hong Kong’s current political reform debate. As part of Hong Kong’s preparations for the 2017 election, the government recently concluded a five-month public consultation that elicited some 124,000 comments. Its summary document, released on July 15, was blasted by Hong Kong’s pro-democracy “pan-democrats” and academics for being “unscientific and lacking credibility” when it asserted that the “mainstream” of Hong Kong society supported the current nominating committee system. The government report also failed to mention how many supported popular nomination, the annual July 1 march, or the “Occupy Central” movement. If, as expected, the government’s official reform proposal does not allow for public nomination of candidates, pro-democracy “Occupy Central” activists plan to take to the streets and blockade the city’s main business district with 10,000 protestors. The movement, led by Hong Kong University professor Benny Tai, has said it will wait for the government’s proposal, due out before the end of the year. But plans are already afoot for some form of civil disobedience as early as August. “Occupy Central” organizers held their own preparations at the end of June, with a citywide referendum on a number of proposals for changing Hong Kong’s electoral system. Expecting some 200,000 votes, the movement saw a nearly 800,000-vote turnout—about a quarter of the electorate—with most supporting public nomination. In the eyes of organizers, it sent another strong message to Beijing that the Hong Kong people are fed up with their current undemocratic system. That Beijing issued a white paper just days before, asserting its “comprehensive jurisdiction” over Hong Kong and calling Hong Kongers “lopsided and confused,” only helped swell the numbers. Beijing also reminded Hong Kongers that the next chief executive needed to be “patriotic” and “love China.” It was another case of Beijing shooting itself in the foot when it came to managing Hong Kong affairs. If pro-democracy proponents had thought that momentum was building on their side, Beijing and its powerful supporters in Hong Kong wasted no time in pushing back on various fronts with attacks that have continued fast and furious. In one opinion piece, China’s state-run Global Times called the referendum “an illegal farce,” and in another accused the United States of advocating “separatism” in Hong Kong. A former Xinhua News Agency official referred to the exercise as meaningless and questioned whether those who voted knew what it was all about. His comments came a day after a former deputy from the State Council’s Hong Kong and Macau Affairs office said the referendum was unrepresentative, unlawful, and not legally binding. In Ho ng Kong itself, where the tone was slightly muted, governing authorities pledged to listen to the people’s views, but highlighted that any political reform would have to be consistent with the Basic Law—i.e., no public nomination. And a new group, The Alliance for Peace and Democracy, whose individual members are not necessarily opposed to universal suffrage, is currently conducting its own referendum against “Occupy Central,” in which it hopes to show that Hong Kong’s “silent majority” is against the movement. But the opponents of “Occupy Central” and universal suffrage were not content to just issue statements. During the 10-day referendum, the movement’s servers became targets of some of the largest and most sophisticated global cyberattacks in history. What angered many Hong Kongers were not so much the attacks themselves, as they were expected, but that the government voiced little concern and has yet to investigate the matter. Thrown into this mix is a range of less ideological voices—some support universal suffrage but oppose “Occupy Central,” while others ask Hong Kongers to temporarily set aside calls for public nomination for “the greater good.” Several proposals to make the nominating committee more democratic with a larger and broader membership have also been tabled, and could form part of the government’s final reform proposal package. But there’s more at stake than just universal suffrage. Many here fear Hong Kong is already losing its way of life and the many freedoms it enjoys—including the freedom of speech, freedom to protest, and rule of law. Optimists say Hong Kong and Beijing have reached the precipice before, and neither crossed the Rubicon. There’s still a chance that one side could compromise again. But this time is looking different. That’s because Beijing’s leaders are losing patience with Hong Kong, and many Hong Kongers have simply grown tired of fake democracy. Over the past several years, America’s low-key approach toward Hong Kong’s democratic development has resulted in little more than occasional statements in support of universal suffrage. These are usually met with retorts from Beijing accusing the United States of meddling in China’s internal affairs. 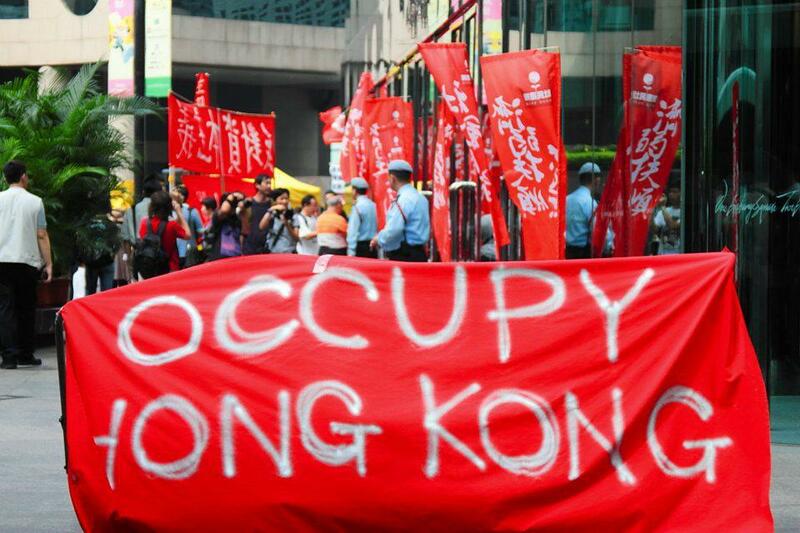 Since 1992, U.S. policy toward democratization in Hong Kong has been driven by the United States-Hong Kong Policy Act. The law enabled the United States to treat Hong Kong, even after its 1997 return to China, as “fully autonomous from the People’s Republic of China with respect to economic and trade matters,” including allowing continued exports to Hong Kong of sensitive technologies. But the Act also contemplated a future when Hong Kong might no longer be “sufficiently autonomous” to justify continued preferential treatment under U.S. law. In such an eventuality, the U.S. president could terminate Hong Kong’s special status “until it regained sufficient autonomy,” meaning it would be treated just like any other Chinese city under U.S. law. While most Hong Kongers and their supporters in the United States still hold out hope for the success of “one country, two systems” and the preservation of Hong Kong’s high degree of autonomy, events on the ground now bear closer watching. As initially written, the Act required the State Department to send an annual report to Congress on the state of Hong Kong’s autonomy and its democratic development. That requirement lapsed in 2007. Now would be an excellent time to bring it back.